The HKVC is honored to have been part of the The Hong Kong Festival Wind Orchestra’s 2011 Christmas Concert at the Hong Kong Cultural Center Concert Hall on December 25, 2011. Fellow guest performers included Good Hope School (Primary) Choir and The Hong Kong Children’s Choir’s choral and tap dance groups. We performed three songs as the concert’s third set. We started with Bob Williams’ “Merry Christmas Past” to establish the concert’s restful Christmas spirit. Our second song, “Have You Heard?” by Jay Althouse, celebrates the birth of Christ in Bethlehem and alternates between upbeat and peaceful sections, allowing us to demonstrate the versatility of our vocal skills in both solo performances. We closed with “A Rhapsody of Christmas” arranged by Ed Lojesky – a medley of Christmas carols including the “In Excelsis Deo”, “Greensleeves”, and “Silent Night” that ended our performance set with some familiar Christmas warmth. 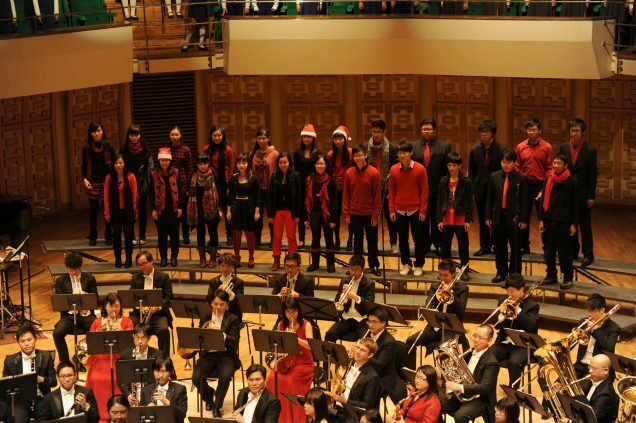 We are extremely greatful for the Hong Kong Festival Wind Orchestra for providing us with this fantastic opportunity to spread holiday cheer and share 2011’s Christmas wishes with a fantastic audience. In light of the HKVC debut several months prior, this concert also allowed us to celebrate fond memories of our past half year together while looking forward to a wonderful 2012.